President took part in the celebrations on the occasion of the Day of the Baptism of Rus-Ukraine. President Petro Poroshenko believes that only the Patriarchate of Constantinople can secure the unity of the Ukrainian Orthodox Church (UOC). He stated this in a speech at Kyiv's St. Volodymyr's Hill in honor of the baptism of Rus-Ukraine on 28 July. The president also noted that the UOC is in dire need of immediate attention from Constantinople and autocephaly. "The Orthodox Church in Ukraine, is in dire need of urgent attention of the Ecumenical See of Constantinople. Only Constantinople is capable of helping the Orthodox in Ukraine to unite and resolve the canonical status of the Ukrainian Church in the world of Orthodoxy structure," Poroshenko said. "Opinion polls show that an increasing number of Orthodox believers in Ukraine want to have, as is customary throughout the Orthodox world and in most Orthodox countries, a single, local, autocephalous church. A church that is united by cross and prayer but administratively independent from other ecclesiastical jurisdictions. It is a historical trend that cannot bypass Ukraine," the president stated. The president thanked Ecumenical Patriarch Bartholomew I for his attention and prayer for Ukraine and expressed hope that he will continue supporting Ukraine. 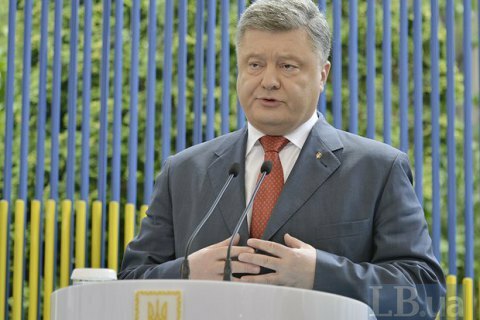 Poroshenko noted that Ukrainians with great hope learned the news of the creation by the Synod of the PCC a special Commission for the Review of the UOC autocephaly request. The Verkhovna Rada has sent an appeal earlier this month to the Ecumenical Patriarch Bartholomew I to provide autocephaly to Ukrainian Orthodox Church. In particular, the parliament asked Bartholomew to issue a Tomos (decree) of the autocephaly of the Orthodox Church in Ukraine, on the basis of which it could take its rightful place in the family of local Orthodox churches.